City Mall Imaginarium is conveniently located in Skopje City Mall (on the second floor) and offers a wide spectrum of activities for children. All activities are perfectly safe as the equipment is imported from Sweden and in accordance to the highest safety standards. Every aspect is supervised by a professional and all activities are designed to promote the physical and mental well-being of children. In addition, City Mall Imaginarium offers access to the internet as well as food and beverages. Location:	4 Ljubljanska St.
Habyland is a Children Center where the adventure begins. 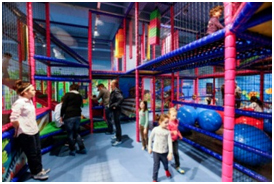 It offers an indoor play area for children up to 12 years and outdoor area that hosts a skating ring and bergodrom, trampoline, snowboard simulator, rodeo bull simulator and costumed animators. While it provides exceptional amusement for children it offers a cozy coffee bar with internet access for parents. The staff is friendly and professional and would love to help you organize a birthday party or friends gathering celebration. Habyland also organizes creative and interactive workshops for children of different ages. Location:	Bul. "8th September"
Hockey Arena and Figure Skating Ring at the Sports Center Boris Trajkovski is yet another place where children of all ages can spend their free time. This facility can be used as a recreation area or it can support children’s physical wellbeing by offering opportunity for them to join some of the courses for skating or hockey. Location:	Bul. "8th September"
The Sports Center Boris Trajkovski hosts two modern indoor swimming pools which are used for recreation, swimming & diving club activities. Children can enjoy swimming and leisure time in the little pool ‎ which offers floating pool chairs and pool slides. The pool is managed up to the highest standards in regards to maintenance and safety. The Sports Center also has a summer terrace with lounge chairs, aerobics club, fitness center, sauna and rhythmical gymnastics hall. There are four sports shops for visitors who need to purchase sports equipment. Location:	Bul. "8th September"
Theatre for Children &Youth is a national theatre where children and teenagers can enjoy in the creativity and imagination of the performers who are children themselves. The theatre has staged over 182 performances seen by over 20 000 visitors. Location:	4 DimitrijaChupovski St.
JUMBO is conveniently located in the Vero Supermarket and is a real haven for kids. One can purchase, at a reasonable price, toys, art supplies, baby care products, pettoys and surprisingly beautiful and creative birthday decorations and gifts. Location:	Vero Center 1 Bul. KochoRacin St.